Frosty Drew's celestial sights will blow your mind. “Okay, it’s the moment of truth here.” Scott MacNeill, director of the Frosty Drew Observatory in Charlestown, bends over a research-grade map for a solar telescope and tinkers away. It’s a hot sunny day and I can feel sweat beading on my forehead as I stand just a few feet behind him in the compact observatory building. But he pays the humidity no mind, staying 100 percent focused on the task at hand. Peering over his shoulder, I see a light blink. MacNeill is not some mad scientist wearing a white lab coat and glasses. He’s a systems and software engineer in a T-shirt and jeans with some scruff. He’s also a guy who loves space. MacNeill was eventually brought on as associate director in 2009 and then took over as director in 2013. He’s been working on broadening the program and its outreach ever since. “I don’t think enough people realize that this is the darkest spot in southern New England. There’s no light pollution out here,” MacNeill says. Situated right off Route 1 in the middle of Ninigret Park, I wonder how such a large area remained untouched by development. MacNeill says it’s all thanks to the observatory’s namesake, Edwin Foster “Frosty” Drew. Despite contracting polio as a child in 1954, the South County native went on to graduate from Brown University with a degree in writing, a knack for public speaking and a passion for conservation. 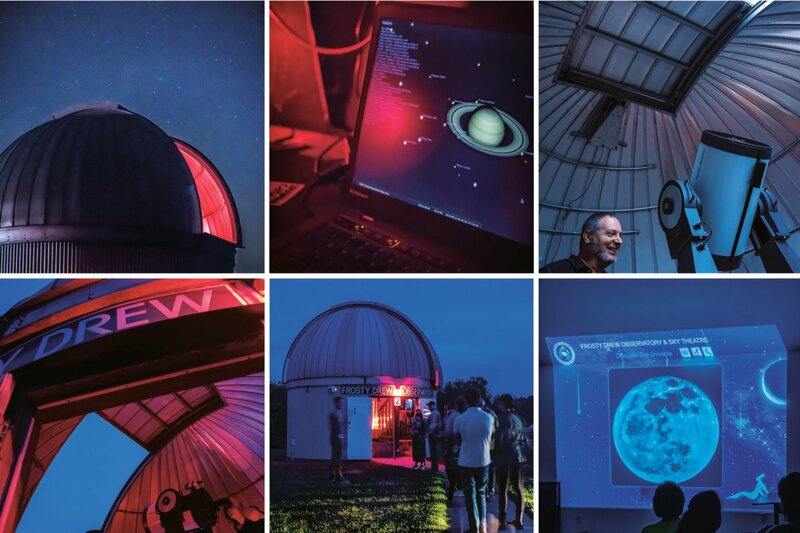 Top, left to right: The Frosty Drew Observatory is said to be one of the best places to see the Milky Way in southern New England; a laptop allows for a closer look at Saturn’s current position and condition; director Scott MacNeill stands with the observatory’s massive telescope. Bottom, left to right: The observatory’s dome is able to move and adjust so that its telescope may be pointed towards any object in the night sky; a number of eager patrons line up to enter the observatory; a live projection of the moon plays out on the screen at the neighboring Sky Theatre. Present-day Ninigret Park was first home to the Atlantic Airport before it was converted to the Naval Auxiliary landing field in 1942. Then, when the air station was decommissioned in the ’70s, the land went up for sale and a local nuclear power company soon emerged as the leading bidder. When Drew caught wind of the plans, he put together a petition asking for the land to be turned over to the Department of the Interior. His efforts saved the area from development, but Drew did not get to see it become a park and wildlife refuge in the 1980s; he died in 1976 at the age of twenty-eight. He has since been inducted into the Rhode Island Heritage Hall of Fame and the observatory, the nearby nature center and a memorial fund honor his memory by bearing his name. The Frosty Drew Observatory of today is all about breaking down the elitism that is often associated with astronomy and physics. Even I, someone who has always shied away from science, find that I’m fascinated by all of the machinery scattered about the small space as well as the numerous sky charts that adorn its walls. It helps that MacNeill has a way of explaining it all in an easily digestible yet riveting manner. He’s especially interested, however, in inspiring younger generations. And with such a dynamic program drawing people in from all over New England, it’s entirely possible. This includes free (though a $5 donation is always appreciated) stargazing nights when the observatory opens for public viewing. Every Friday night, starting at 6 p.m., people of all ages and interests are encouraged to make the trek to see the wonders of space — from sun spots to neighboring planets to distant stars — up close. The observatory is home to a giant telescope set up on a wooden pedestal that points towards an opening in the domed roof. Like most things nowadays, it’s operated through WiFi. “Depending on the night, we track different goings on in space. Right now, it’s focused on Venus, but if I go over here…” He hits a few keys on a laptop and suddenly I hear a whirring sound. I look up and see that the telescope is shifting a few inches to the right. “Now it’s tracking the star Spica,” MacNeill says. But because only thirty or so people can fit in the observatory at a time — no good in the summer when visitors flock by the hundreds — the Frosty Drew team has taken care to set up additional attractions. While all guests are given designated observatory entrance times (which are spaced out every thirty minutes), in the interim they can look through other telescopes set up on the lawn outside the structure; chat with volunteer sky evangelists about the theme of the night (i.e. the Milky Way); head across the street to the Sky Theatre for presentations by local and national astronomers; or hang in the lunar lounge, an outdoor space that features a live projection of the moon’s surface. Even in the dead of winter when the frigid temps make standing in an open observatory nearly impossible, the Sky Theatre welcomes visitors with hot chocolate and a livestream of the night sky, taken directly from the observatory’s telescope next door. “People love it here. We all geek out together,” MacNeill says with a laugh. He shows me a guestbook where visitors have recorded everything from “Thank you for showing me the stars — science is amazing,” to detailed drawings of constellations in the margins. The overwhelming theme: People are blown away. A couple of weeks later, I decide to add mine to the list. It’s pitch-black when my friend and I pull into the observatory parking lot around 10 p.m. — so dark, in fact, that we have to use our phones to light the way to the greeter’s station. The vibe is exactly as MacNeill described: People are milling between the various attractions and chatting about all things space. While we’re waiting for one of the volunteers to fetch the director, another tells us about the night’s highlights. Though the weather is hazy, we should be on the lookout for the Perseid meteor shower as well as Mars and Saturn, both of which are visible to the naked eye. She also tells us about a little boy she saw earlier who was so excited about getting to hug a “space rock” in the Sky Theatre that she thought he was going to have a stroke. When MacNeill joins us, he pulls out a laser beam and begins outlining various objects in the sky. As he’s explaining that you can always find the North Star in relation to the Big Dipper, I see a purple streak flash above his head. It’s the only meteor I see that night, but it’s also the only meteor I’ve seen in my life. I’m beyond thrilled. 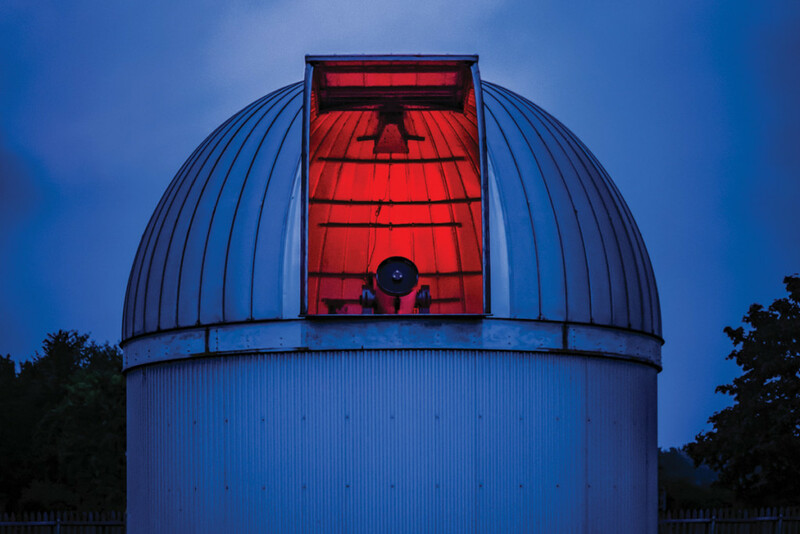 We wander around a bit, peeking through the different telescope setups and attempting to take Instagram-worthy shots of the Milky Way with our DSLR camera, and before we know it, it’s our turn to enter the observatory. Inside, faces are illuminated only by the red glow of nearby equipment and the stars overhead. It’s also eerily quiet. As the line moves, each person steps up, leans their head towards the telescope, squints their eyes and then gapes in awe. When it comes time for me to peer through the lens, my breath hitches. I knew I was going to see Saturn, that I had even just seen it outside, but now I can really see Saturn. This time, it’s not just some bigger, clearer point in the sky. It has a form and features. It’s yellow and bright and tilted to the side (or at least appears to be, thanks to the slant of its rings). For me, Saturn had always been like atoms; I know they’re there, but they’re intangible, so they never felt “real.” Now, Saturn feels real. I tell her I didn’t think she would be into that kind of thing. Her reply: “Seriously? Who isn’t into space?” She has a point.